Softcover, 8 1/4 in. x 10 3/4 in. Here they are in one place. All the great cars from Great Britain that turned heads on highways and broke records on road courses. They all made an impact in America. Read valuable information about these cars gathered from owners around the world. See memorable photos selected from dozens of sources. Learn about British terms and car clubs. 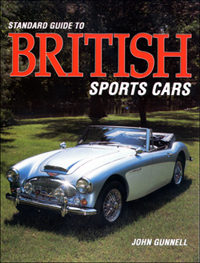 The Standard Guide to British Sports Cars has brands from A.C. to (Fairthorpe) Zeta!